A number of signature selections will have you ready to come back for more. Discover the distinct flavors of Ancora! in Utica, NY today. Our corporate-casual environment also features an open kitchen and a crepe station, so you can see your food being made. You'll find concrete-exposed high ceilings, stage lighting and a custom-designed wine tower bar, as well. Our cocktail list includes a number of martinis and nightly drink specials. We can also cater your next event, party or corporate gathering, whether it's onsite or at an offsite location. 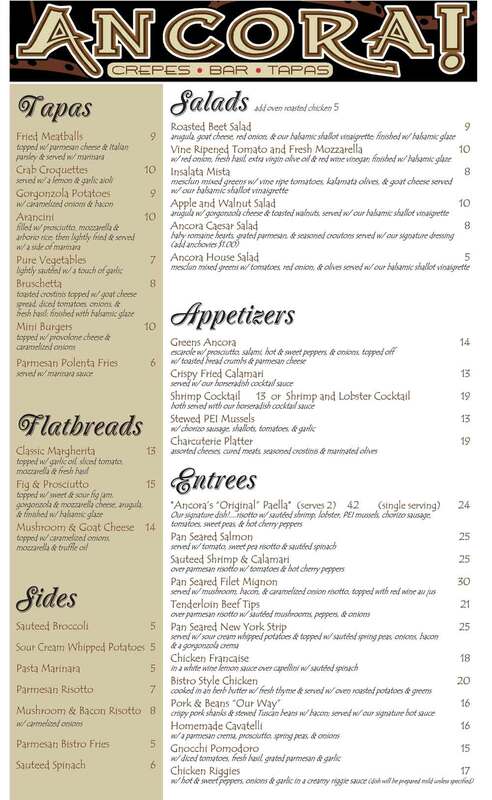 If you want something prepared that's not on our menu, let us know so we can accommodate your needs. Call 315-724-4815 today to learn more about our catering services. Located next to the Stanley Theatre, Ancora! first opened in 2005. In those days, current owner Dan Loconti was a dishwasher. Now the owner for the last three years, Ancora! has continued to focus on excellent Italian and Mediterranean fine dining, as well as catering. Visit our restaurant for your next meal in Utica, NY.